We all need masculine happy birthday cards from time to time. So I used more grungy colors with the Antique Glimmers background and strip of paper for the Happy birthday stamp http://techniquejunkies.com/happy-birthday/. 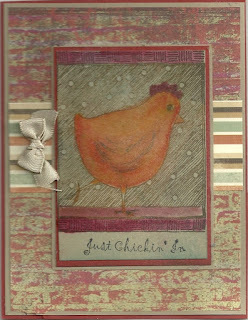 The background is stamped with Wasted http://techniquejunkies.com/wasted/. 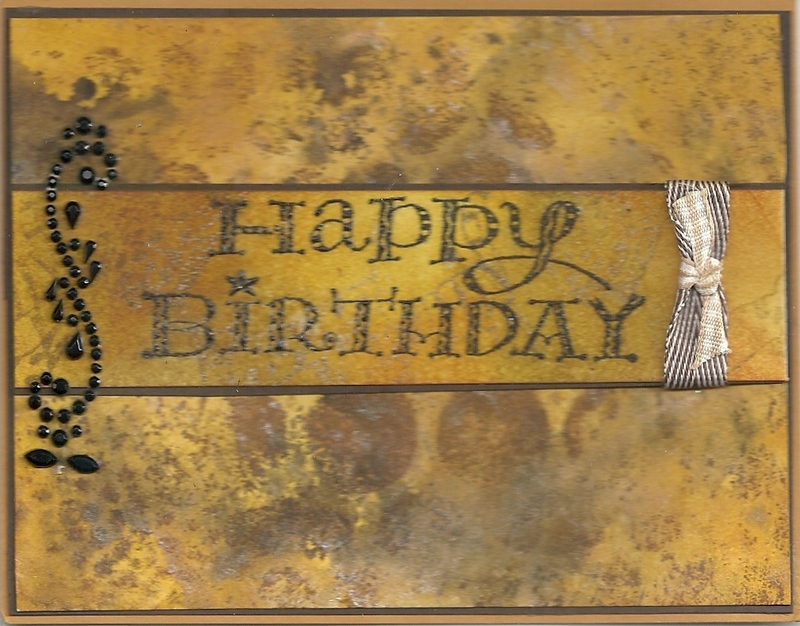 Layers, black pearls, and masculine ribbons finish up the card. Sometimes in life you only need a quick and simple card. This card fits that description. 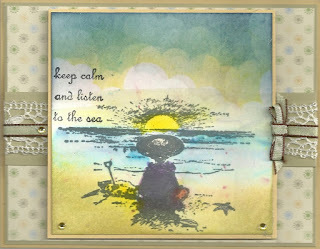 I stamped Sea Waves http://techniquejunkies.com/sea-waves/ on a prepared background. 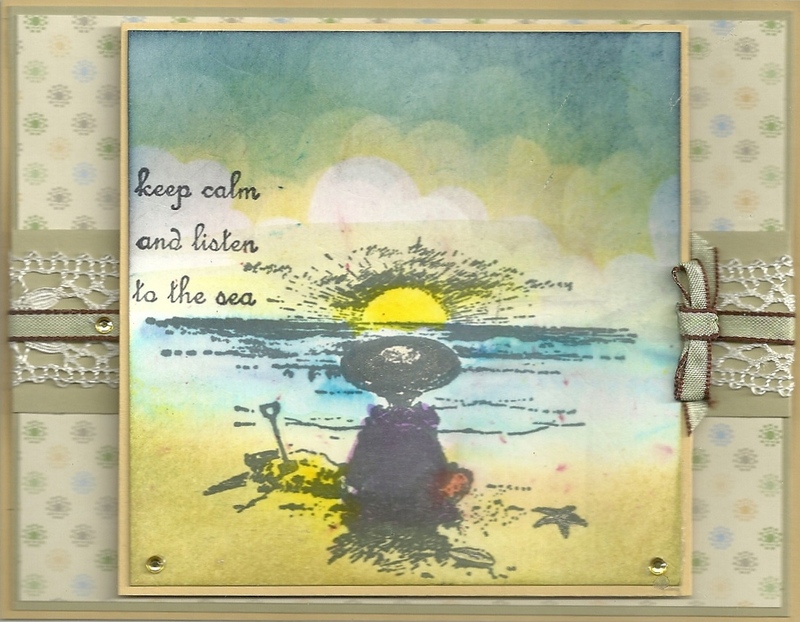 Then I stamped Listen to the Sea over and over in a random fashion on a strip of white vellum. I layered that strip over the Sea Waves and attached some flowery ribbon and tied pale blue ribbon around the card. And of course I used Glimmer Spray. Have a wonderfully ink day. Isn't this fun birthday stamp just so cute? 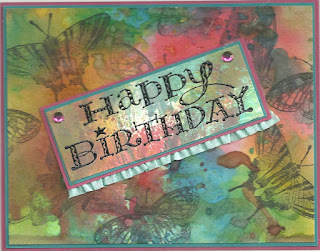 http://techniquejunkies.com/happy-birthday/I used several butterfly stamps on the background - http://techniquejunkies.com/butterfly2/ - http://techniquejunkies.com/butterfly3/ and http://techniquejunkies.com/butterfly4/. 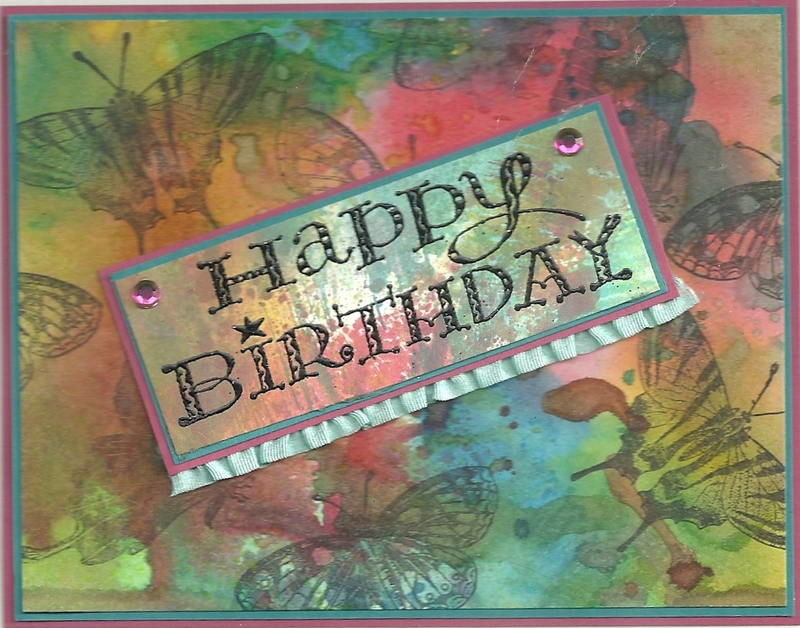 Both the background and the scrap of paper for the Happy Birthday stamp are use Antique Glimmers with lots of bright ink colors and glimmer spray. While on vacation recently with our daughter and her family we went to the beach several days. I always enjoy going to the beach with young children. Young children see the world so differently than adults, don't they? I love seeing the world through a young child's eyes. 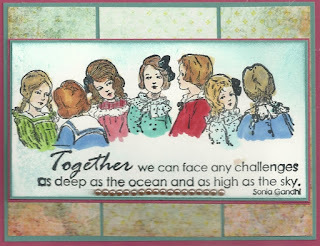 This stamp - Beach Girl http://techniquejunkies.com/beach-girl/ - reminds me of that time spent with my grandchildren. I used a cloud template to sponge the sky with various colors of ink. The sentiment, Listen to the Sea http://techniquejunkies.com/listen-to-the-sea/, is perfect for this scene. I colored the sand and sea with Peerless Watercolors. For this card I used Glamour Girl http://techniquejunkies.com/glamour-girl/, and Key Script http://techniquejunkies.com/key-script/. The girl was colored with Peerless Watercolors http://techniquejunkies.com/peerless-watercolors/. 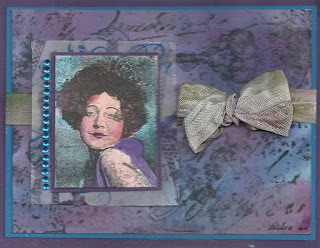 The girl image was layered on a piece of vellum before being attached to the base card. I used Antique Glimmers technique before stamping Key Script. 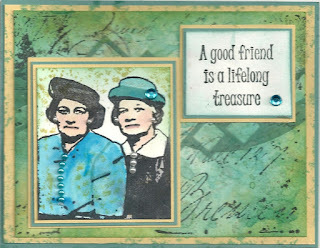 One of the things I have learned in the last few weeks is that good friends are more than just friends -- they are indeed a treasure. 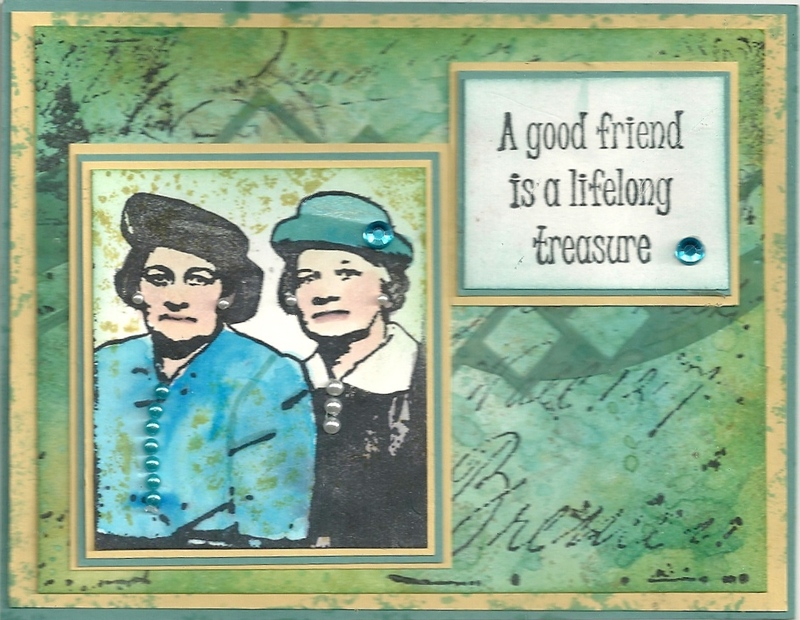 My hubby and I have had friends that are truly "life long treasure" and we have been friends for not just a few years -- but decades in many cases. And even we may not have seen each other for several years, we could always call them up and just talk as though it was only yesterday that we saw them. 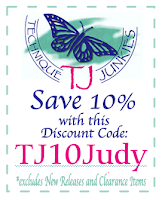 This card uses these stamps - A Good Friend http://techniquejunkies.com/a-good-friend/, Hat Ladies http://techniquejunkies.com/hat-ladies/, and Key Script http://techniquejunkies.com/key-script/. I also used a die cut of green vellum. 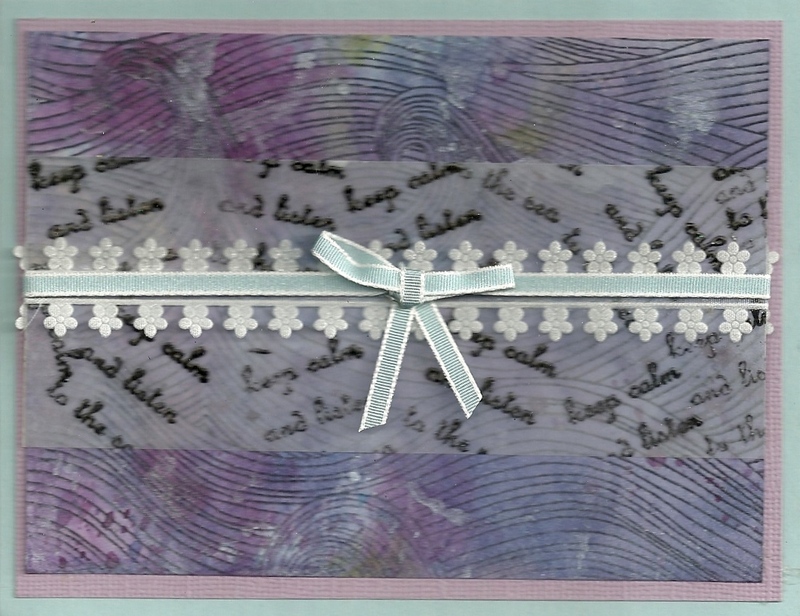 And I layered all of the pieces of the card. 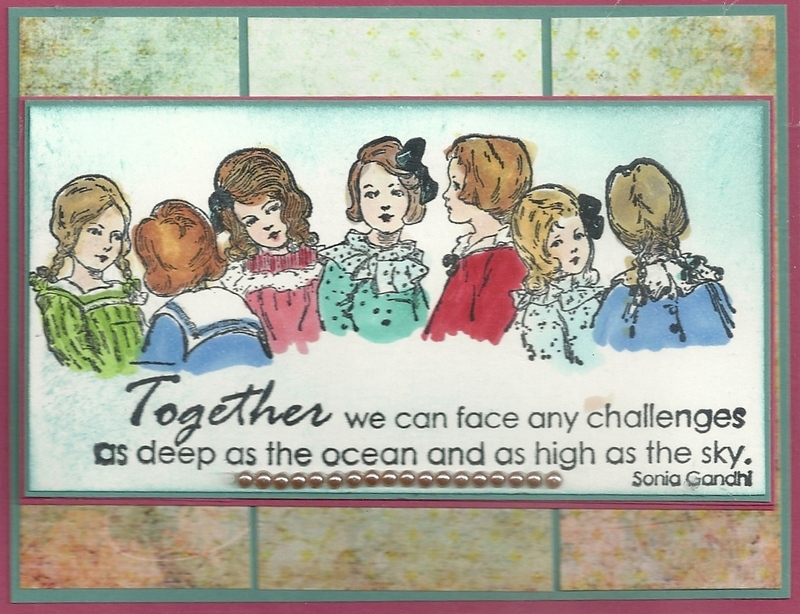 I used Copic markers to color the ladies, a glitzy spray, and the Antique Glimmers technique beneath the Key Script stamps. 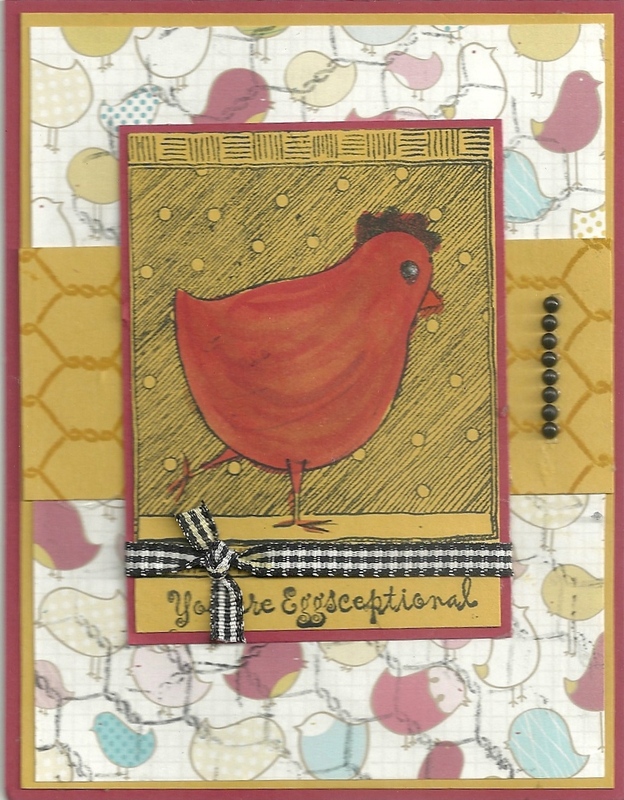 Have you been able to "get inky" lately? The image is colored with Copic markers. 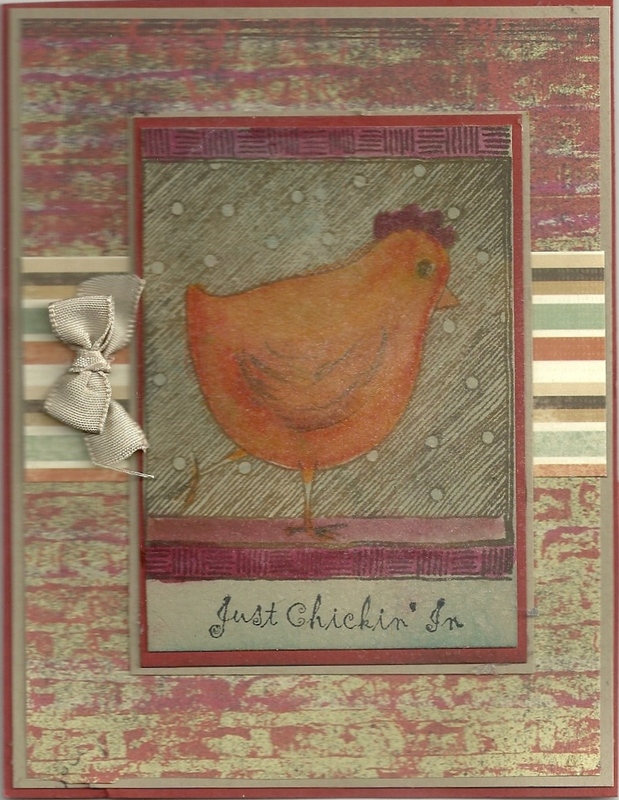 Background paper was altered with inks and cut in to three strips for added interest. 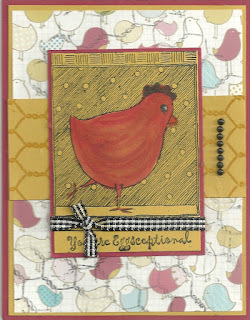 I hope you enjoy some stamping time! 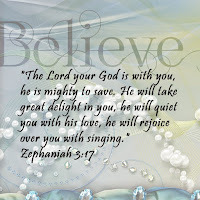 Ronald Edward Jackson unexpectedly went home to be with his Lord on Saturday, June 20, 2015, while vacationing in Florida. Born on June 15, 1944, in Rochester, N.Y., to James A. and Myrtle M. (Jackson) Jackson, he was the youngest of six children. 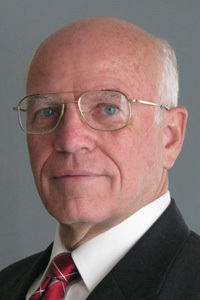 He graduated from Greece Olympia High School in 1962.